You’ve gotten a taste of the photos, now it’s time for the article! 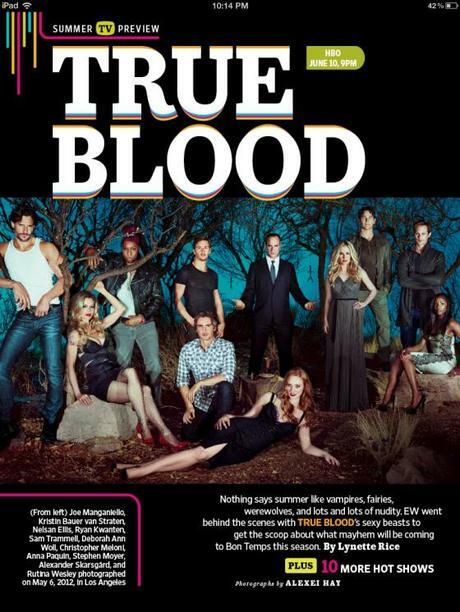 One of our visitors, Laura, shared a link with us, where you can check out the True Blood Season 5 article in Entertainment Weekly. Thanks Laura! We thought you might be interested in finding out what it says. Be careful…there’s a few spoilers in it. If you don’t want to know – don’t click on the images below! Hmmm…there’s one interesting line in this article that really popped out at me. While this spells bad news for us…it means no Eric and Sookie lovin’ from the sounds of it. It’s good too. This fits in with Eric’s character. He’s not the type to dwell on things. He’s not the type to sit in a corner and cry. He’s an alpha male. Even though his heart has been broken, he won’t let something like a broken heart bring him down. Sookie will come to her senses eventually.